From scooters to bike share to apps that can deliver a burrito at the tap of a button, “emerging mobility” is rapidly changing how people — and products — get around. Emerging mobility services and technologies are those that automate driving, matching rides, and sharing vehicles. Rather than taking an “anything goes” approach to emerging mobility that could result in unintended impacts to people and our public spaces — or simply prohibiting them and missing out on their potential benefits — San Francisco is moving forward with a thoughtful, collaborative approach. With our partners at SFMTA, we have adopted 10 guiding principles for emerging mobility, including everything from safety, to equity, to tackling congestion. These guiding principles help us evaluate how emerging mobility services and technologies can help us meet our city’s goals. We’ve developed creative methods to gather data and measure impacts, such as our research on ride-hail services, that allow us to identify successes and areas for improvement. Our guiding principles and data are already informing the development of pilot projects, capital improvements, policies and permit structures that we are putting into practice. Still, discussions about how public spaces should or shouldn’t facilitate emerging mobility services are not easy. For a real-world example, hear Senior Planner Warren Logan talk about curbside management and congestion at the “Curb Access Considerations for Emerging Mobility” session on Saturday, April 13. As we try to understand their impacts on our existing transportation systems, we’re also working with emerging mobility providers to ensure that their services are accessible to disadvantaged or vulnerable communities. For example, San Francisco’s bike share system, Ford GoBike, offers a Bike Share For All program that significantly reduces membership costs for low-income residents. E-scooter providers operating in San Francisco have similarly made commitments in their permit applications to serve underserved communities and to reduce membership costs. A next step is introducing new ways to make payments with cash and gift cards to lower barriers for folks who don’t have bank accounts or credit cards. As planners, we care about these new technologies and services not because the tech is cool, but because we want to maximize the potential to improve people's lives. Hear Transportation Authority Director Tilly Chang discuss how we weave social and racial equity into all our work at the “Building Careers in Equity and Planning” session on April 13. P.S. While you’re here for the APA National Planning Conference, we hope you try out some of the innovative transportation technologies on our streets for yourself: hop on a shared bike, rent a scooter, or try one of the first forms of shared mobility that San Franciscans pioneered here before anywhere else in the world ... a Muni cable car! Top image: Ride sharing, bike lanes, and transit in San Francisco. Photo from the cover of the Emerging Mobility Evaluation Report by the San Francisco County Transportation Authority. 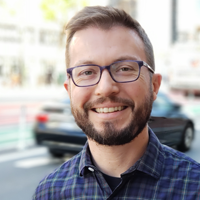 Mike Pickford is a senior transportation planner at the San Francisco County Transportation Authority, where he develops funding recommendations for all kinds of transportation projects. He has a master's degree in urban planning from the University of Washington and a bachelor's degree in Urban Studies from Brown University.